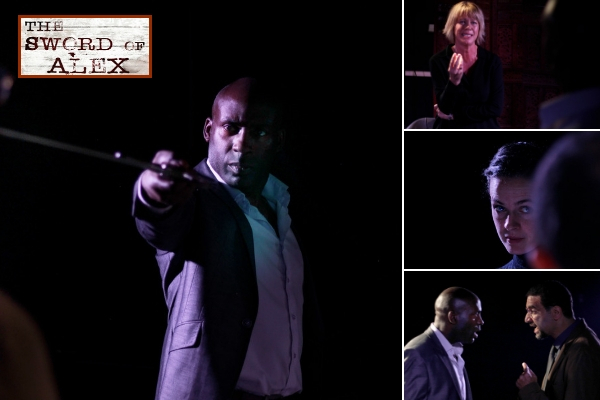 “The Sword of Alex” by Rib Davis, currently on at the White Bear, Kennington, is an interesting play of ideas which deals with the attempted secession of Nikal, a country or region (as with all such disputes you takes your pick), from an unnamed nation. Shades of Biafra you might think, but the playwright is purposely vague about the location to avoid pre-conceptions and allow the audience to concentrate on the battle of ideas: it could be Africa, the Balkans or elsewhere in Eurasia. Two old friends, Antonio (Patrick Regis) and Karl (DK Ugonna), are negotiating as a ceasefire in a conflict is due to expire. Each of them is the leader of his own side and on their agreement, or otherwise, will depend on the fate of their territories and the lives of thousands. It is a clash of nationalism and what nationhood constitutes, complicated by the personal history between the two; both of them aware of the other’s personal backgrounds. Davis contrasts the personal and the political actions of the protagonists through their private entanglements: Antonio has had a long affair with Calantha (Kate Terence) and Karl is in a controlling relationship with the psychologically battered Gina (Georgia Winters). Here we see how politicians behave when their guard is down and the cameras are off. Strong performances from the four-actor cast who work well together and make maximum use of the space – no doubt helped by the able direction of Brian Woolland – keeping up a good tempo but varying the pace and attack for maximum effect. Patrick Regis has the pick of the lines and his performance, braggadocio balanced with silent menace and coiled violence is a noteworthy one. A well-appointed attractive stage design works to keep the action flowing, the central part of the stage dominated by the eponymous sword serving as the area of confrontation and dialogue between the antagonists, and each couple’s personal dramas are largely confined to one side of the stage each. Nice touches in the onstage displays of Nikal’s history and nationalist paraphernalia which the audience can share. Rib Davis is a keen proponent of large-scale, history-based plays. This is an epic play in a small space. It deserves to be seen. In performance until the 6th October.